FA: Brian Bennett, George Ridgley, Sept. 2008. 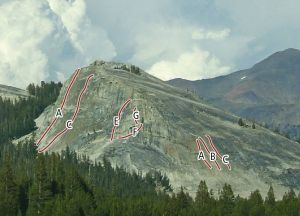 A new alternate start to Crying Time Again, Cry Baby starts a bit right of the normal start and takes a more direct route to the second pitch anchor. The crux is after the first bolt. Which SuperTopo guidebooks include a topo for Cry Baby? Cryin' Time Again is route A. A fine route to introduce yourself to Tuolumne climbing. THe splitter crack system up Lembert Dome creates the Direct Northwest Face.